A couple of days ago new reader Samuck asked me why I bother with individual stocks when my ETFs seemed to be performing so much better, which you can clearly see in my latest net worth update. Although I’ve discussed my preference for dividend growth stocks in the past, I feel like his question touches opon a another point that’s often brought up: do I benchmark my dividend growth portfolio to an index and, if so, why? Exchange-traded funds basically track an index that is made up of individual stocks that are selected following a pre-defined set of criteria like market capitalisation and regional diversification. So when Samuck was asking me how I felt about my individual stocks underperforming my ETF holdings, his question boiled down to whether I don’t mind that my stock picking underperformed the MSCI World, MSCI Europe, and MSCI Emerging Markets indices during the same time frame. Of course, these indices are not as popular as the S&P500, which is often synonymous to “the market” for much of my Northern American readership, the Euro Stoxx 600, or the FTSE 100, but the principle remains the same. So is it wise for a dividend growth investor to benchmark the performance of his or her stocks to a popular index? Before we can answer that question, we should take a quick look at what many a dividend growth investor, including myself, tries to achieve, especially within the framework of financial independence and early retirement. We are all building a stream of passive income by investing in high quality companies with a long history of providing excellent returns to shareholders through increasing dividend payments. By doing so on a consistent basis, I have already amassed and secured future dividend income to the tune of €500 every single year. That’s a significant income bump simply because I trust and continue to believe in a couple of businesses! If you’re looking to become financially free, it’s key to build monthly passive income that surpasses your expenses, which is very easy to track using the dividend growth investing strategy. Does it matter then if your investments didn’t beat a randomly weighted index of companies when building a consistent and reliable stream of dividends? Not at all! While I am highly certain that the companies I’m invested in will continue to forward me a piece of their profits in the form of cold hard cash, which I can use as I please, I can’t go to the grocey store to buy a loaf of bread or a carton of milk with a fun statistic like outperforming the stock market with a couple of percentage points. Furthermore, comparing the performance of your dividend stocks to an index all the time might lead you to take on too much risk. Our brains are programmed to react emotionally when rational reasoning fails, after all. When “why didn’t I beat the market?” becomes the modus operandi of our investing strategy, chasing higher yields for the sake of higher yields is only a small step away, and that’s a very dangerous road to be on. Even if the Euro Stoxx 600 benchmark outperformed my little portfolio every single year for the next two decades, I’d still be able to retire early or enjoy a financially free life. I’m saving and investing a large percentage of my paycheck every single month, which is what reaching financial independence ultimately is all about. Yes, a slightly lower return might have me working a month or two to three longer, but in the long-run that won’t matter in the slightest. What is three months when you have a lifetime of free time to look forward to – time you can spend any way you want? I’m not going to lose one night’s sleep over that simply because I believe in my current investing strategy. Would you? I agree that comparisons to indices do not really add anything actionable to the dividend investor. If your goal is to earn enough dividends by age 40 to cover expenses, then thats the benchmark you should compare yourself to. Whether you end up doing better or worse relative to a benchmark by 1-2%/year is irrelevant to your goal. Glad to hear you agree. 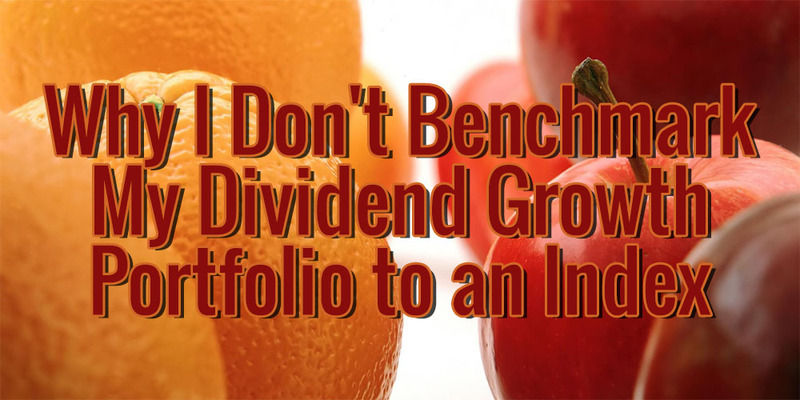 There seems to be overall consensus on this topic, so that can only mean one thing: benchmarking to an index is not meaningful for a dividend growth investor. It’s far more important to keep track of your own goals than a random basket of companies devised by someone at some point in the past, just like you said! Right! There are hundreds of indices out there, so which one should you compare against? Here in Europe it’s even more complicated as every country has its own star index. Belgium’s BEL20 is only 20 companies strong, so is it a good measure of overall market performance? I think not. I’m glad you’re also looking at the growing stream of passive income rather than your actual investment returns. It’s nice to see those percentage points tick up month after month, but a growing cash flow is even better. I’m with you here NMW. You could create a million different hypothetical benchmarks or alternatives to measure against, but all that matters is that your making progress towards your own investing goals, at a pace you are comfortable with! In the end you’re right though. The only benchmark that’s important is the one you set for yourself. I you meet your goals what does it matter if you could have gotten there just a little bit faster? For income oriented investors, the steady AND increasing stream of dividends is the main priority as it provides a very reliable income growth. I can see where Samuck is coming from though, for lots of investors total return is the main method of measuring success. For those concerned with Total Return, it would make sense to have a benchmark index such as the S&P, FTSE 100 or Euro Stoxx 600 becuase if your not beating the benchmark indexes your portfolio is better served being invested in these indexes which takes no due diligence at all; this is not the case with performing DD to find individual income stocks for the long-haul. Its essentially irrelevant whether or not you beat the market over a general time period as this may change over the long-run. I guess if you had an infinite time set to look over, this would become much more relevant, ignoring dividends. I think its really just a matter of preference and overall goals that you are striving for. I will continue to seek out dividend growers so that I can predict my income stream for years to come, no matter what the market does on a day to day basis. Great additions, thank you for adding those. You’re right that for those concerned with Total Return benchmarking does make sense on a yearly basis. Still, I feel like that timeframe is too small to reliably predict your returns over the long-term. Your comment on the infinite time set closely resembles this point of view, I believe. To me it’s all about growing a steady stream of dividend income to replace my regular income, so I don’t see why comparing the growth of my portfolio to an index matters. I’m on the same boat as you NMW, I benchmark against my progress and my goals. I think that’s better than trying to benchmark against some index that someone else created. That’s a great attitude! Nothing is more important than achieving your own goals, so why not compare your progress against those? I agree with you here, NMW. My benchmarks are my targets. If I hit them, I am ahead of my benchmark. Also, if you were using a benchmark what is surely important (unless I have missed something) is not the value but the dividend yield of the index you look at. After all, as you say, it is on dividends you are living on not selling off your equity. I am quite open-minded to index (and other more passive) investing in general. I hold some in my portfolio as a “control” experiment so to speak. If for any particularly important reason I think my active method is no longer my preferred method I would be happy to slowly shift over to a new strategy. This is highly unlikely, however. 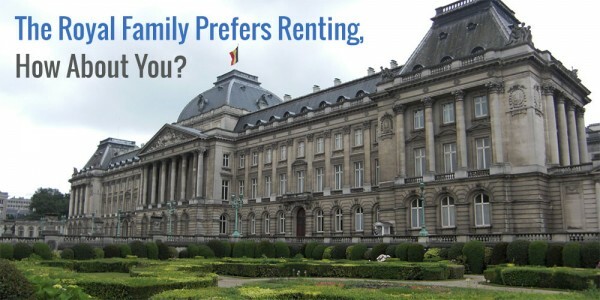 Interestingly, DIY Investor (UK) recently talked about his thoughts on this here: http://bit.ly/19joyMI. The key is to be rational and not rash in coming to conclusions about such choices. Overall, for me it is the journey which is as important as the destination. Part of that is developing a confidence and competence in managing my financial future in the short, medium and long term. I think active dividend investing helps ensure this. Index and Investment Trust investing is a little more distant. In some regards this is great, but in others it is not so. For me the control I have over my portfolio is not only an education but an enjoyment and–as a result–an encouragement to save and invest more. In this context, even if I did underperform the FTSE 100 so be it. I would have been less heavily invested without the same interest I have in individual stock investing. Over the short and long term that is the most important factor! Another great article. Thanks for this! You seem to agree with almost every other dividend growth investor out there, so that’s saying something! Benchmarking against your own targets is the only standard you should hold your investment performance to in my opinion. I hadn’t specifically made the distinction between comparing the dividend yield and the total return of your investment portfolio, but it’s a good point to bring up. Personally I would compare the Total Retun of an index, rather than just dividends or stock appreciation. Otherwise you’re comparing apples and oranges in my view. I’m totally with you on switching to passive index funds if active investing is no longer my preffered method. 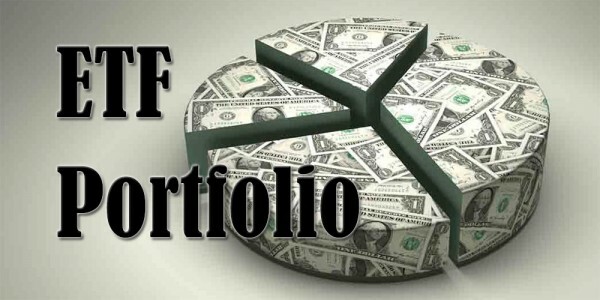 You can see that my portfolio also consists of ETFs, so I’m quite partial to them myself. If my passive income ever surpasses my expenses, I believe I’ll start putting the excess passive income into passive funds as a way to further diversify my portfolio and have a little leeway during retirement, so I won’t worry too much about potential dividend cuts like DIY Investor mentioned in his article. The reasons you mention for being an active investor I can get behind 100%. Passive investing is too passive for me. It doesn’t keep me on my toes like dividend growth investing does. The excitement every time I receive a dividend payment just makes me want to save more and more. PS: do you have a public blog of your own? Thanks for the reply, NMW! Yes, I think my last point was the most important for me. Without the enjoyment and interest I would not have invested anything nearly as much as I have done. That is what really turbocharges my dividend income (both present and future!). I agree, once I start getting closer to retirement I suspect I may turn more towards ETFs and investment trusts. 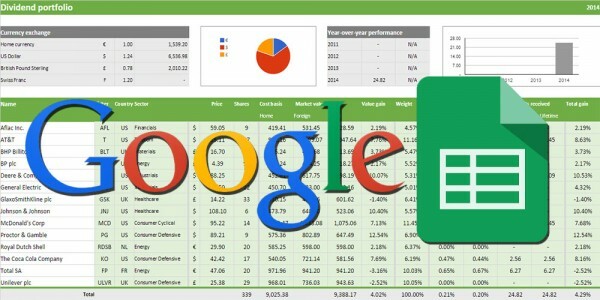 That is actually what DIY Income Investor (not the same as above) is doing: http://bit.ly/1EM7XtQ. For me, this is for several reasons: (1) They tend to be better diversified and thus less volatile and as I will then be at income and capital defence mode that is attractive; (2) hopefully it will simplify the portfolio for my family after I have gone; (3) Being simpler will be useful if my health deteriorates for any reason but clearly I would still need an income! I was thinking of setting up a plan in which for every decade or so I add an extra 5% of ETFs/ITs. That would not start until I hit 30 though, at the earliest. (That has got me thinking now!). It would probably accelerate at some point. We will see! Long way to go yet! Dividend cuts don’t worry me too much currently. As I simply reinvest them and I am not living off the dividends as long as I think the business is still sound I am happy to keep them in there (hence why Tesco still sits in my portfolio). It is why I am also increasingly looking at lower yield but higher growth dividend stocks. Thank you for linking to DIY Income investor. That’s the second awesome blog I didn’t know about you bring to my attention today. Your reasoning for switching towards index funds when closing in on retirement all make sense. Currently dividend growth investing is a lot of fun, but once retired I might not like the hands-on approach all that much anymore. It’s a good thing that we have plenty of options available to us. Who knows what will happen during the next couple of years that’ll have us change our ideas and/or strategies? I know what you mean! Every time you think you have a good grasp of most of the blogs out there another pops up to grab your attention! My pleasure. DIY Income Investor was, actually, pretty much the first I came across. A long time ago now! I have just pretty much finished my article writing up by shift in “retirement gear” and ETFs and investment trusts in a bit more detail. I will post it at some point but I still have a big backlog of articles I have to go through! Got to work out which should go first! There are many reasons why the shift to a more passive, pooled investment strategy as you get older is a good idea. I hope though that I still find dividend investing enjoyable. I don;t see why I won’t! Exactly. The key is to be flexible with your investment approach. Solid and consistent, but also flexible! A hard balance to pull off! Same to you, have a great weekend. I am packing for a work trip next week. Should be good! Ended up publishing my post on shifting to “retirement gear” ahead of the other. Here it is if you’re interested: http://bit.ly/1IaH2hI. All that matters to me is that I’m on pace for financial independence. Beating or not beating anyone else is irrelevant to that. Looking only at yourself and your own goals is a great attitude when it comes to investing. Just do your own thing and make sure you meet your own objectives! I compared my portfolio performance to an index fund last year out of curiosity last year. I did the comparison by taking all the investments I made in stocks on the days that I made them and ‘buying’ the equivalent amount of the funds on those days, so it was as fair a comparison as I could make. However, I wasn’t worried about beating the index but rather I wanted to understand that if I could get reasonable dividend income from an index fund, was it worth maintaining an individual stock portfolio? Back then I had a much lower yield criteria at the time so needless to say, VHDYX beat my portfolio in current income. I think it’s certainly a reasonable approach for someone to pick a dividend growth index fund or ETF and pay into it regularly to achieve FI. Vanguard has three low-cost dividend funds in the US now (VDADX, VHDYX & VDIGX) for example. Some people may not have time or inclination to invest in stocks directly and funds / ETF offer instant diversification and a low barrier to entry. However, that’s quite different from trying to beat the total return of an arbitrary index as you and the comments above have made clear. You’re absolutely right though! All too often people focus only on total return or on their own strategy without realizing that someone else is trying to achieve something completely different. What I find most striking about dividend growth investing is that a significant percentage of my return comes from dividends rather than stock appreciation. When I try to explain the difference to most people they just nod their head and say they did a better job. Many of them almost religiously believe in “beating the market” as a standard of excellence. Your comparison is quite interesting. I’m curious to see a new benchmark in the future with your new selection criteria. Personally I shy away from yields under 2% because the foreign withholding taxes and dividend income tax in Belgium would eat me alive. I’ll probably move into low yielding and “safer” stocks once my portfolio covers my expenses. Thank you for adding your own performance to the discussion. Good points, NMW, and I totally agree. Additionally, I think it’s important to consider that many strong dividend stocks are generally low-volatility. Yes, we’ll lag in periods when the market is booming, but we’ll experience smaller downturns on the other side, as well. Does it mean div growth stocks will underperform in the long term? Maybe, but certainly not by as much as it would appear when looking solely at a bull market–and that small underperformance gives great benefits, like reliable and regular cash flow! That’s a great point to make, I didn’t consider the lower volatility of dividend stocks when writing this post. Furthermore, total portfolio value doesn’t matter too much to someone looking to build passive income through dividends. One of the mistakes many people make is indeed the fact that we’re currently in one of the biggest and longest bull markets ever. It’ll be interesting to see what happens to dividend growth investor’s performance during a downturn compared to people looking to beat a set benchmark. Intresting to see you that we are all in agreement on this point. As all of you mentioned, I measure our performance based on our objectives. It doesn’t really come as a surprise to me that we’re all in agreement over this. We’re all pretty smart people and we know that the only thing that matters is making our own goals and objectives. I am a total return investor. So for me it is important to know, if I can beat the market. Otherwise I would invest in an index fund and that’s it. For my early retirement I need only a decent dividend income. If this is not enough, I will also continously sell parts of my portfolio. That’s why overall portfolio’s performance counts for me. This is also the reason why I only buy stocks at a fair or low price. You put forward some arguments why total return and beating an index is important to you as a benchmark is important, but I don’t really see the link between beating the market and your own goals. How does a better investment result than the market average help you? Furthermore, do you compare your returns on a year-to-year basis or over longer periods of time too? I fully agree with you. Indices provide a nice snapshot of overall value in the market, but it does not provide the whole picture. That value is just part of what DGI people want, we also want the generated income and growth of that source. Absolutely! 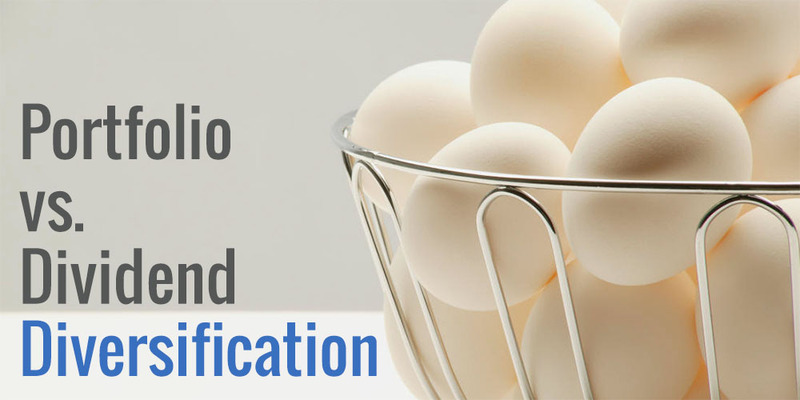 The biggest mistake many new investors make is looking at charts showing stock appreciation (or depreciation) without taking dividends into account. It’s interesting to see, for example, that AT&T has been going sideways for the past two to three years, yet much of its return comes from the high dividend yield it offers. I hate to be the only one that disagrees, but I do. 100% a value dividend growth investor but how you do over the very long term (yearS if not longer) matters. If you are a point or two but with steady and growing income that is one thing, but if you are cumulatively 5%, 10%, or worse then it just does matter. You could have bought the broad index ETF and then sold the shares. At the very least it provides a lagging indicator if your screen is working. Don’t hate yourself because you disagree! That’s what makes our community great: together we’re much smarter than all on our own. When you have the benefit of hindsight, it’s very easy to say you could have bought a broad index ETF and then sold the shares. However, at this point in time I have no idea which index, when do I have to buy into it, when do I have to sell my shares, etc. Furthermore, I really don’t see how losing out to a randomly made up index while you still manage to hit all your own goals and objectives is a bad thing per se? The only standard you should hold yourself to is the one you set for yourself. The results and return of others should be of no matter, in my view. I’m not going to lie, I get a thrill of selecting individual stocks and that is one of the reason I don’t invest in an index. But I have a long-term view, making money of value growth and dividends and not price change. If in the end of a 20 years period I have only made a 5% increase per year and the sp500 has made a 8%, I’m not going to cry over that. I’m at that point far beyond my fellow 40-something that has not cared about his personal finance. You and I definitely are on the same page. To me the only benchmark that I should consistently beat consists of my own goals and objectives. If I hit all my targets year after year, what’s the point of comparing your return to an index or even someone else’s return? It shouldn’t matter at all! PS: do you have a blog of your own? No, I don’t have a financial blog. I think, you and everybody–there is to many good bloggers to list–else got this covered without my help. I also do not benchmark against any indices. My own targets are, am I growing my income? Is it above inflation? Is it relatively safe and well-diversified? Great attitude! I believe you’ll do fine if you manage to keep those indicators in the green. Even if the FTSE100 did better during the same time frame, who cares? I’m with you – no point in comparing your portfolio’s performance to an arbitrary metric. Better to suppress our emotions where possible to prevent any rash decisions. The only emotional reaction that I’m cool with is how amazing it feels to get paid dividends! Ha, I can imagine you feel amazing when you get paid dividends considering you just received your first ones! Congratulations. Let’s hope they’re the first of many more to come. Thanks for this great post, NMW. I love it you’ve made this a topic. I suggested benchmarking because I believe that we need to hold ourselves accountable to our actions, also in investing. And check and refine regularly. To all the posters against benchmarking: sorry but you are actually on blind flight modus. For instance, how could you be satisfied with a 15% increase of your portfolio when you realize the market has gone up by 20%? This comparison should be all-in, of course: capital gains, dividends, fees, taxes. Because there are options to using dividends as a means of generating a long-term income stream. I would just take out 4% per year, for instance. Which benchmark index to use? Just choose something straight-forward. If you invest mostly in the US, S&P 500 or Russell 3000 might be good choices. In Switzerland, the SPI. For global, compare yourselves with Vanguard All-World or iShares MSCI. I was glad to! It’s an interesting topic that not much people pay attention to even though they should. While I understand that you wouldn’t be happy with 15% gains compared to a 20% market increase, there’s a high chance that you take a very limited time frame. I’d much rather compare portfolio performance to an index over longer periods of time (to account for downturns too, for example). Consistently beating a benchmark isn’t my goal. I’ll be happy when I reach financial independence through dividend growth investing before my fortiest birthday. If I make it sooner all the better, but I won’t cry over any lost gains compared to a different investment method. Thank you for providing such an interesting topic! I think it’s a bit of a pity, Nomorewaffles… Right now, you do not need dividend income. Right now the value (and amount) of your stocks should just grow as much as possible. So if you’re giving up profit now in exchange for the fact that the profit comes in the form of dividends… You’ll reach your desired amount of assets later. I must say that I don’t know how holding stocks, or getting dividends, is taxed in Belgium. Perhaps because of taxes it is better to buy the dividend paying stocks right away? You’re absolutely right that I do not “need” the dividend income, but I disagree with the fact that my amount of desired assets will be reached later. That’s the difference between a wealth accumulation approach and a passive income approach. I don’t really care how high my overall net worth is as long as my dividend income is high enough to sustain my lifestyle. The dividends also make it a lot easier to track my progress and they help me stay rational instead of acting emotional when my portfolio takes a dive. The upside of DGI is that you get an extra income stream, without having to sell anything of your portfolio. The downside of DGI is that these stocks typically have lower total returns than non-dividend paying companies + you have to pay 25% dividend tax. Your desired amount of assets will without a doubt be reached later using the DGI strategy, by a least a few years. You are essentially experiencing all the downsides of DGI without any benefit at this point in your life to receive dividends. You are right about the upside of dividend growth investing, but I disagree with the downside. It’s true that the total return of dividend paying companies isn’t always higher than the total market, but I don’t really care about the total return. All I care about is the yield on cost and future dividend growth. As such, the taxes don’t matter too much either. The difference between index funds and DGI lies in the fact that the rewards of DGI lies much further into the future due to the fact that my passive income continues to grow without having to touch my capital. Besides, I personally feel better with a DGI strategy because it satisfies my need for immediate gratification. I’m not sure I could do 15 years of just index funds with no positive feed back and reinforcement on a regular basis. People who worry about how they’re doing relative to an index are focusing on the wrong things. Focus instead on your monthly (or annual) cash flow and what level of freedom that is going to buy you. What some other index is doing has zero to with what you’re working at! Don’t agree, Ryan. Benchmarking allows you to see how you’ve done in comparison with total market – and decide eventually whether it’s not better to pursue another strategy, like index investing. I agree with you, but I also understand where the pro-benchmarkers are coming from. Clearly we’re discussing the “personal” part of “personal finance” because everyone has his or her preferences when it comes to investment approach. Building my passive cash flow is what it’s all about for me too, though! Might have been mentioned in the comments but hidden fees aren’t represented in benchmark’s either. Good point! Although most index funds use really small funds, it does make a difference in the long-run. I haven´t gone through the whole stream of comments so this might be a double. But the way I think about it is the following. I guess currently you are not reliant on any dividend income since you have a job and are able to even set aside funds to invest in stocks that generate income for you. Now lets say you are pursuing the next 20 years or so, going to work and accumulating dividend Growth Stocks which Dividends you reinvest. If you are not beating a Benchmark say the MSCI World or whatever low risk benchmark you have in mind, you took on more risk, due to less diversification, and you will end up with less capital at the end of your 20 year horizon. Assumed that you start to need the income of your dividends in year 21 you would be able to generate a higher yield, meaning higher yearly income, by investing the capital the index returned for you in the dividend growth stocks you have now selected, than you would have from owning your current portfolio from start. I think it should be handled this way. If one is reliant on income DGI seems very intelligent, if one is not it might be questionable to pursue such a strategy, also because Dividends are subject to taxes. At least in Germany that is the case. So the higher the dividend payments the more you finance the state and not your dreams. I too am attracted to that approach because it is nice to see income grow steadily without much volatility, however I think if outperformance cannot be achieved one is worse off with DGI. Don’t worry about not reading every comment, your opinion was voiced by some others too. While I believe you certainly make some excellent remarks, you also make a lot of assumptions, I believe. First, you assume that that my expenses and job income remain the same for twenty years. While the chance of that being true is quite high, there’s no way to know for sure. I recently talked about taking on a mortgage to pay for an apartment. The extra dividend income could help me pay off more each month and thus take out a larger loan than otherwise possible, for example. Second, let’s say that after 20 years of being invested in index funds I decide to switch to an income generating portfolio. Let’s also assume that the market is at an all-time low, a period when blue chips (which many dividend growth stocks arguably are) often don’t drop as much as the broader index. Our superior returns for 20 years through index funds are now rendered mute because I’ll have to buy the dividend stocks at a lower yield (relatively speaking of course). This is just one example of a situation in which your logic doesn’t fully hold, or at least not without 100% certainty. Third, never forget about the personal aspect of personal finance and investing. Your comment illustrated that everyone is different and prefers different approaches. I myself need the regular dividend payments to stay motivated and keep my financial independence focus. This might not apply to everyone of course, but it’s the main reason why I prefer DGI over index funds (which I also have a small portfolio in). And last but not least, I benchmark against my own goals rather than an index because these goals are my own! Thank you for chiming in and sharing your point of view. Yes sure everyone has different views. I find it very hard for myself not to compare my performance to an index. It might be an intelligent thing not to do so, since it is almost impossible to generate sustained outperformance by picking individual stocks. I have miserable failed to get anywhere near the Performance of an MSCI World in the first quarter, making my stock-picking completely obsolete. I hope the performance picks up and the stocks that I acquired really turn out to be undervalued and deliver market beating performance in the future. In the end if both of us avoid big mistakes we will do just fine in the long run whether DG stocks are bought or not. Especially when you compare of what you have already achieved by 25 leaves i´d say most of the people in the dust. Exactly! We should be looking at this from a long-term perspective. I understand you feel disheartened by one quarter of serious underperformance, but that’s just one quarter. Who knows what happens over the next twenty? Nobody does. I believe anyone willing to commit to an inherently good strategy for a long period of time through a high savings rate will do great, irrespective of the strategy they employ. About my blog. I haven´t been very active recently, too much going on at university. You might want to check it out later that year when I have more time to write. I have purchased Philip Morris recently but haven´t done a write up on it. Think it is a good value at that prices, also for us europeans the company´s currency issues aren´t that serious since they have all their operations outside the U.S.